I have worked with C.R. Jackson, Inc. on three different projects and they have consistently exhibited professionalism, fairness, and timeliness. They exhibit an interest in providing a quality end product for the owner. We look forward to working with them again. C.R. Jackson is dedicated to creating safer roadway conditions for the traveling public through the construction of highway and secondary road projects. Our forces have built, paved, and repaired countless miles of roadways in South Carolina. Typical customers of C.R. 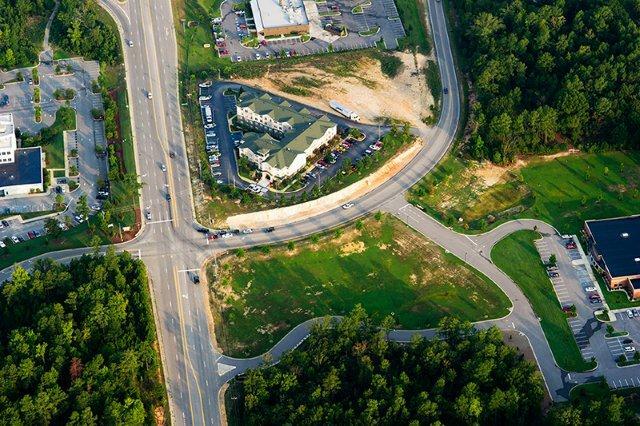 Jackson roadway construction are South Carolina Department of Transportation, subdivisions, school districts, small businesses, industrial sites, and commercial developments. Our services range from maintaining roadways to completing roadway relocations to creating new road systems including land clearing and asphalt paving. As a heavy highway infrastructure company, we are capable of completing major roadway construction of any scope. We recognize that one of the most important aspects of creating a high quality roadway is the type of equipment used. Our top-of-the-line equipment includes new and well-maintained asphalt pavers and rollers (see our page about asphalt paving). These asphalt paving machines are completely equipped with Moba Grade Control Systems to maintain a smooth ride and achieve the surface slope required. The combination of our knowledgeable and experienced workforce plus the utilization of the right asphalt paving equipment ensures that C.R. Jackson is fully capable of completing any size highway or roadway construction project. In 2011, C.R. Jackson, Inc. was honored to receive the Quality in Construction Award at the National Asphalt Pavement Association annual convention. This distinction was earned based on our performance on the I-20 Eastbound and Westbound projects in Lexington. This recognition highlights the excellent job that our on-site personnel do each day of maintaining a safe work zone while creating a quality product for the traveling public to enjoy. Contact us for your roadway construction needs. We also provide asphalt paving, land clearing, storm drainage, and design-build services.